With the secession of the Confederation of Independent Systems and the deadly confrontation at Geonosis, war has become inevitable. The Galactic Republic has deployed the massive Grand Army of the Republic alongside Jedi Generals to quell further uprising and bring rebellious systems back to the fold. Among the Separatist worlds, politicians and warriors fight to preserve their right to self-determination and freedom from the corruption and malaise of the Republic Senate. Bounty hunters and criminal cartels play both sides off one another. When the fighting comes to a standstill, scavengers plunder the debris of once-proud star destroyers and scuttled starfighters. Heroes and villains rise and fall as the struggle escalates into what will become known as the Clone Wars. 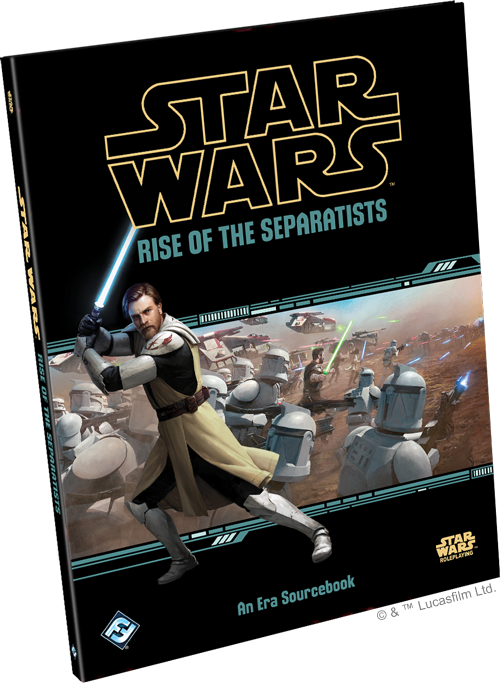 In Rise of the Separatists, the newest sourcebook for Star Wars Roleplaying, you’ll be able to fully enter a new era of the Star Wars saga, whether you’re playing with Edge of the Empire, Age of Rebellion, or Force and Destiny. 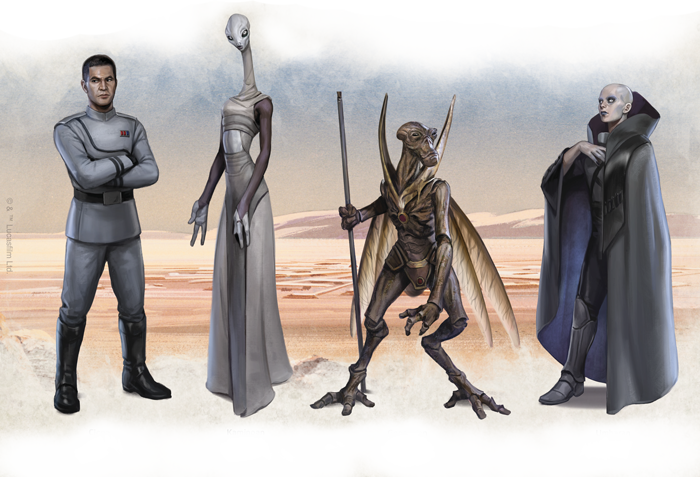 In this supplement, you’ll be able to play as one of the Kaminoans or their creations, the clones. Alternatively, you can take part in the conflict as one of the industrious Geonosians or the scheming Umbarans. With four new species, two new full careers, and four new universal specializations, you can explore new playstyles and experience this iconic period of galactic history as never before. Today, we’ll take a closer look at some of the character options coming soon to your tabletop! While many equate the struggles of the Republic with the ground fighting seen on Muunilinst and Malastare, battles continue under another guise in the political arena. The Umbarans, deft at navigating the factions and ambitions of their homeworld castes, revel in the intrigue and backchannel diplomacy that whispers down the halls of the Senate. With their uncanny ability to sway others to their cause, some wonder whether they aren’t capable of some form of mind control. Their shadowy reputation is only deepened by their aversion to bright sunlight and their superior senses in darkness. For those Umbarans who have fallen out of the caste systems and have turned to a life of crime, their entrancing gaze allows them to flourish in the underlevels of Coruscant and the back alleys of industrial words and far-flung outposts. On the front lines of battle, a more direct approach is required. The clones born and bred in labs on Kamino form the indisputable backbone of the Grand Army of the Republic (GAR). Their genome was carefully selected for superior strength and speed, and from the time they are decanted, their athleticism is put to the test in a series of rigorous trials. Alongside their physical training, battlefield tactics and discipline are drilled into clone recruits from an early age, all to ensure that the Republic is provided with the perfect fighting force. Yet, as they face their first true tests in the field, the clones must learn to balance their inborn tendencies for loyalty and obedience with their newfound desire to forge their own paths and identity. Flung into squadrons as battlefield commanders, pilots, or troopers, these soldiers gain strength from the familiar sight of their brethren. All three of these archetypes are represented as specializations with the new Clone Soldier career! The Clone Officer specialization makes use of their training to command their brothers-in-arms in battle and lend them an ear when the going gets tough. Clone Pilots specialize in piloting the iconic Low Altitude Assault Transports (LAATs) and All-Terrain Tactical Enforcers (AT-TEs), gauging the lulls in battle to deploy complements of clone soldiers swiftly while sustaining minimal casualties with the Assault Drop talent. The unsung heroes of the Clone Wars, Clone Troopers serve as the rank-and-file infantry in the GAR and are equipped with an impressive arsenal to match. These soldiers excel at employing heavy weaponry to devastating effect, including the gunnery emplacements found on artillery installations, vehicles, and starships. No matter their role in the squad, hard experience teaches these clones the best ways to take out their enemies. With access to the Clanker Killer talent, clones can prove their brute effectiveness at dispatching CIS droids en masse, seizing on every opportunity to take the perfect shot or aim for the battle droids’ weaknesses. Finally, the Masters of the High Council have rallied the Jedi to serve as leaders and special operatives in the conflict. Whether they’re leading the vanguard, pursuing dangerous special missions, or directing strategy from the gunships, the fighting capabilities of the Jedi Knights and their Padawans are revered and feared around the galaxy. Jedi Knight serve as warriors, diplomats, ambassadors, and scholars all at once, entering into “aggressive negotiations” at need or staging daring rescue missions for Senate dignitaries. Padawans learn from experience, and they can come through in unpredictable and surprising ways. No matter their level of experience, the Jedi must harness their skills and wisdom to see justice done and avoid letting the high emotions of the battlefield tempt them to the dark side. Beyond the Clone Soldier and Jedi careers, players looking to create character concepts well-suited to the Clone Wars will also be able to choose from the Force-Sensitive Outcast, Republic Navy Officer, Republic Representative, and Scavenger universal specializations. These can be mixed and matched with the existing careers and specializations from all three Star Wars Roleplaying core rulebooks, so your group can tell their own stories in this era, no matter whether you’re playing Edge of the Empire, Age of Rebellion, or Force and Destiny. How will you turn the tide of battle in this great era of galactic conflict? Discover a trove of player options and find your place in the galaxy in Rise of the Separatists. Pre-order your copy of Rise of the Separatists (SWR11) from your local retailer or from the Fantasy Flight Games web store today! 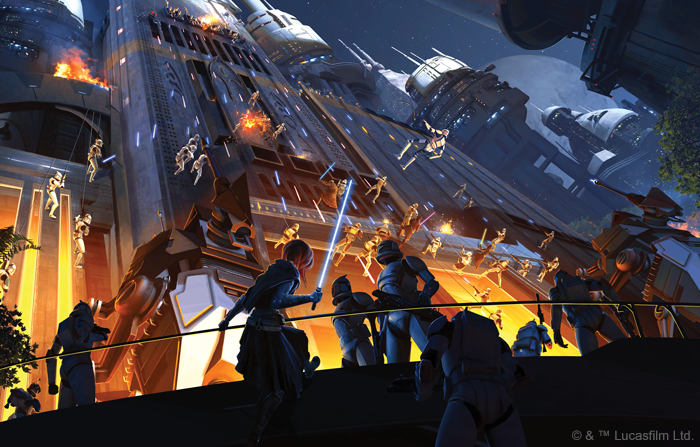 Take your adventures from the center of the galaxy to the Outer Rim with Star Wars Roleplaying! Spanning three interlocking systems and covering every part of life in the Star Wars galaxy, Star Wars Roleplaying is your gateway to adventure.